In most of the developing world, there is a booming second-hand market for almost everything. Second-hand clothes, shoes, phones, electronics and so on. The appeal and motivation vary from person to person, or place to place. Factors such as cost, quality and availability determine choice and patronage. Unlike in some of the developed world, second-hand products of diverse sorts are popular and well patronized. Many towns and cities host daily or weekly markets where goods of diverse sorts are displayed and eager customers come in search of the best bargain. Most items on sale make their way from Europe, the United States and other parts of the world. Trading in second-hand products is in itself a lucrative venture as traders often smile to the bank. However, this is a largely unregulated space and no one monitors the quality of goods that come in, adds much value or ensures proper recycling of relevant components. Most attempts to recycle electronic wastes are done in a manner that is harmful to the individuals and environment. Finland has taken things a step further. Here, 7 non-profit “reuse centres” called Kierrätyskeskus have popped up around the capital Helsinki. These centres offer what they call preloved items including furniture, clothes, toys, books, craft supplies, sport gear and cookware. Beyond being giant thrifty stores, these second-hand supermarkets are offering and a promoting a way of life based on sustainable consumption. They also offer an online shop that serves the whole nation as well as an environmental-education programme. While these ideas and practices aren’t entirely new, they signify the increasing awareness and consciousness of the increasing pressure of human life on the planet, and the need to cut down consumption. With a global population forecast of 9 billion people on the earth by the year 2045, certain individuals and governments are recognizing the need to shift from the traditional ‘linear economy’ to a ‘circular economy’ by reusing and recycling more. The government of New Zealand is one of such cases where they are aiming to reduce waste with such an approach. 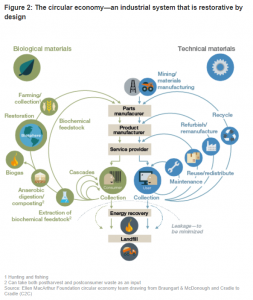 World Economic Forum’s research on the circular economy estimates that embracing this idea represents a $4.5 trillion global growth opportunity by 2030. The Forum hosts and facilitates a public-private collaboration called PACE, the Platform for Accelerating the Circular Economy, launched in 2017. PACE explores ideas like how to reduce electronic waste, or e-waste, or recover more plastic waste. It estimates that in 2016, 44.7 million metric tonnes of e-waste was generated globally and that such rubbish contains high-value deposits including gold, silver, copper and platinum. E-waste is still a major problem, particularly in developing countries that lack adequate capacity, technology, know-how, policy and regulatory framework. Philips has a “lighting as a service” initiative, under which it retains ownership of the lighting equipment it supplies and can manage it from an environmental point of view at the end of its life. Vodafone offers a “trade in” service for old devices. H&M collects old garments for reuse and recycling, allowing customers to swap end-of-use clothes for a voucher. Australia’s Reverse Garbage offers ethical shopping and education for people looking to live more sustainably. In the United States, Ann Arbor in Michigan is one of several cities that has a reuse centre, which helped divert more than 1,200 tons from landfill in one month alone. Another initiative is the global Freecycle Network, which allows people to exchange items for free and has more than 9 million members. In Finland, the ReUse centres stock ecological craft supplies and offer workshops where customers can learn to make presents, jewellery and other items, giving old items a new lease of life. There are loads of valuable lessons for other countries particularly those in the developing world. Considering the relatively large and ever-increasing market for second-hand products, there is need to go beyond re-using and re-selling these perused and preloved items. We need to place emphasis on value addition through recycling, upcycling and environmental education. Policy-makers and regulators need to step-up to monitor the quality of items brought into each country and ensure that they are properly managed. Wherever you live, the goal is to make sustainable consumption a way of life by making careful, green and conscious decisions on when, where and how to buy, consume, compost, reuse, refuse, recycle, upcycle and dispose.